“I’m not moving this bus until you stop playing that music," the bus driver said to a young Hispanic man last Saturday night. 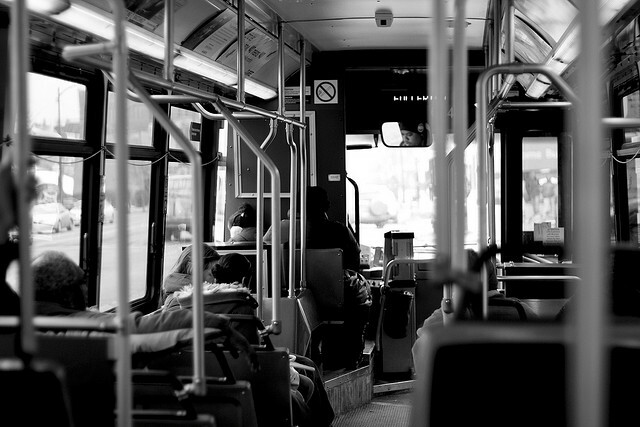 I was riding the #50 Damen bus up to a performance at Martyrs. In the city, you are used to someone’s cell phone speakers becoming a post-Millennium boom box. Loud music on public transportation is a familiar annoyance, one that I have gotten used to having grown up here. At first, you are startled by the intrusion, but quickly you forget it is even there. Still, it does not change the fact that it is an unnecessary nuisance akin to eating on public transportation. To live in a city is to assault the senses. If it is not the noise, it is the sights. If it is not the sights, it is the smells. "I’m so sick of punks like you playing that music,” the bus driver said. By that point, he had stalled the bus and stepped out of his driving area. But the Hispanic man was not listening to music on his cell phone. He was texting or browsing or something else. He was looking down, going about his evening. He was like any other passenger on the bus, minding his own business. No, the music came from two young white men. They were holding the phone up, looking at videos while their music blared, oblivious too of their surroundings. And as the bus driver left his seat and faced the passengers, the two men quietly slipped their phones away and said nothing. It was a sly move and I do not begrudge them for doing so. If someone complains about the noise, the courteous thing to do is to put your phone away. If a situation escalates, it makes sense to defuse the tension. And when faced with potential confrontation, I understand their lack of nerve to name themselves as the culprit. But should they have stepped in? Would you? “It wasn’t. It was them,” I pointed to the two men. And another black woman nodded her head and said, “Yep,” but the bus driver seemingly did not care. He looked back at the Hispanic man, glanced quickly at the two men and got back into his seat, as if nothing happened at all, as if he could not be bothered to know the truth. Or maybe he understood the truth, but could not be bothered to stomach an alternative to what he normally faces on the bus. The next time, he probably thought, the next time I will be right because I am always right, because this is how I see the world. Situations like this are difficult to parse. Did I actually see what I thought I just saw? Did I insert race into a situation that was not about race? My gut says no. My gut says a young man was accused of being the source of a public noise nuisance on the bus because he was a man of color. He was not a witness to what I saw, so his opinion is only based on what I said. But also, I was not inside the head of the bus driver. I do not know if he accused the man because he made an assumption based on the first cell phone he saw or the first man of color he saw. I have told friends and acquaintances about numerous racially-charged incidents in my own life. I’ve told them about the mother forcing her two children out of the pool, the only other two children there, when my sister and I jumped in as little girls. “I don’t want you in there now,” she said. Was I jumping to conclusions? Was my own mother as she later recalled what happened? I’ve talked about being called the n-word in Wicker Park as recently as 2009. I’ve talked about being called “hostile” and “angry” for asking questions at jobs, even though other people who have actually yelled to others in the same setting were not accused of anything. Most people understand where I am coming from and perhaps can offer their own stories as well. But I have also been accused of causing trouble. I have been accused of seeing what is not there. It does not matter that these incidents have occurred only a handful of times, that I don’t spend my life “looking for racism” in every interaction. It is difficult for others, particularly those with privilege, to see wrongs when they have occurred. If it does not affect them, how can it be real? If they do not see it every day, does it even happen at all? I can speak to my own experiences as a woman. I can speak to my experiences as a black American. But there are lives I will never truly know or understand. There are experiences that I will never face because of my age or my sexuality or my class. But the privilege I have does not mean that I can not try to empathize. It does not mean that I can not listen to the things people tell me and observe the world around me and know that some things are more real than my scope of understanding. It does not mean that I can not trust others&apos; feelings or trust their truth. That is the least that I can do.